Fox News drew criticism on Thursday over its coverage of the death of Mollie Tibbetts from an unlikely source: one of their own. 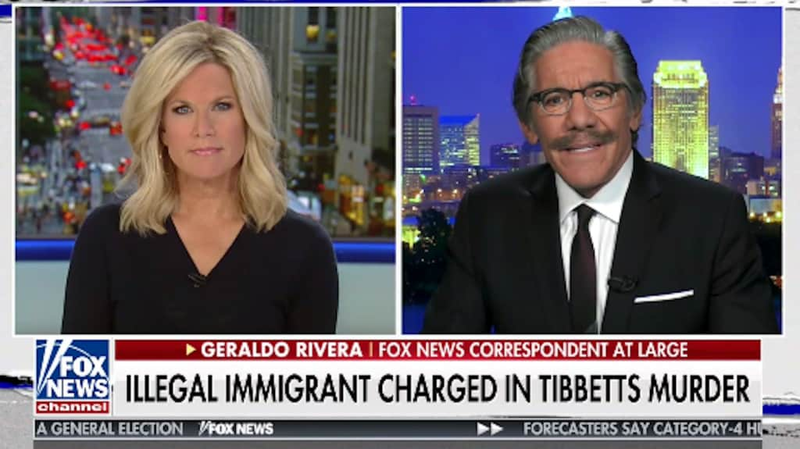 Geraldo Rivera, the flamboyant Fox News correspondent who appears regularly on “Fox & Friends” and “Hannity,” accused his own network of putting “spin” on the Tibbetts story, turning it into a political debate over illegal immigration. Authorities have said that the man accused of killing the Iowa college student entered the country illegally, a piece of information that Rivera said has been inflated, creating a “false impression” about undocumented immigrants more broadly. The evening segment presented a microcosm of how the tragic death of a 20-year-old woman has fanned the flames of the immigration debate and become a talking point for GOP politicians with hard-line immigration stances, including President Trump. MacCallum argued on behalf of Americans who see the suspect’s immigration status as directly related to Tibbetts’s death. Rivera argued on behalf of those who believe immigration status has nothing to do with it, that its prominent display in the narrative of Tibbetts’s killing runs the risk of painting all undocumented immigrants as threatening. Rivera’s comments appeared to be triggered in part by an earlier claim from Texas Lt. Gov. Dan Patrick (R) on Fox News that the media, Democrats and Rivera were “accomplices” in Tibbetts’s murder, a claim for which Patrick provided no explanation. Patrick then appeared to reference earlier statements from Rivera warning against politicizing Tibbetts’s death — before challenging Rivera to a TV debate about it. Rivera accepted. He began his segment with MacCallum saying that Patrick was “stereotyping 11 million people in our country here without documentation.” The focus on the suspect’s immigration status, he said, “feeds the false impression that this population increases violent crime. “It is a falsehood and to use this case to make the point is wrong,” Rivera said. Tibbetts was found dead in a cornfield in Brooklyn, Iowa, more than a month after she went on a jog and disappeared. According to a court affidavit, the suspect, Cristhian Bahena Rivera, told police he saw Tibbetts while she was on her run along a country road, parked his car and decided to follow her. Eventually, Tibbetts noticed and threatened to call the police, and that is when he “panicked and got mad.” But then he claimed he blacked out. The next thing Bahena Rivera claims to remember is that he found a headphone piece in his lap, and then realized he put Tibbetts in his trunk, according to the affidavit. He found her with blood on her head, he said. Then, he dragged her into the corn and covered her body in the stalks, he told police. President Trump used the opportunity to ratchet up support for the border wall and slam Democrats for inaction on immigration legislation. “If Mollie Tibbetts is a household name by October, Democrats will be in deep trouble,” former Republican House speaker Newt Gingrich told Axios in an email. The Tibbetts case recalled the death of Kate Steinle, who was fatally shot in San Francisco in 2015 by a Mexican national, a felon who had been deported multiple times. Steinle’s death became a flash point amid a contentious debate over “sanctuary cities,” such as San Francisco. Lawmakers quickly blamed Steinle’s death on the sanctuary city policy, turning the tragedy into ammunition that would be used to condemn such policies throughout the country. The suspect, Jose Ines Garcia Zarate, was acquitted of murder and involuntary manslaughter charges and convicted only of being a felon in possession of a firearm. His defense attorney had claimed the shooting was a result of an accidental weapon discharge.